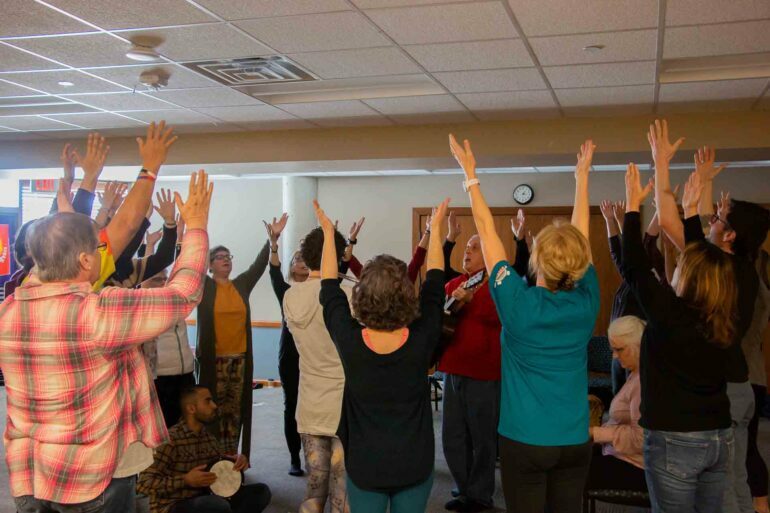 Once a month people come together in the Vermillion library to celebrate peace through music, inclusiveness through connecting with one another and spirituality in whatever way they may view it. Dances of Universal Peace happen all around the country, but Steve Miller, a dance leader in training, started Vermillion’s dances last May. Miller said they take sacred phrases to sing or chant to while moving to them. The dances allowed attendees to feel the meaning of the words through movements that connected them with the earth, the people around them and to whatever spirituality they recognize. The dances happen on the second Sunday of every month and for March’s dance, attendees danced to four phrases. The first phrase, “Abwoon d’bwashemaya,” comes from the Christian faith and Miller said it is the first two words that Jesus would’ve said in the Lord’s Prayer. Miller said the second phrase, “May I take peaceful steps upon the Earth. I bow to you, a flower,” is an English translation of a Vietnamese and Buddhist phrase. For this dance, Miller encouraged the dancers to feel each step of the dance with peace and then bow with that same peace to those who have wronged them in their lives. The third phrase, “Kadosh shemaya,” comes from Judaism and the dance helped dancers connect with one another through moving together and then raising their hands in praise. The fourth phrase, “Om mani padme hum,” is another Buddhist phrase, Miller said. For this phrase, Miller had dancers move around the circle with one another, raise their hands in each direction and then bow to the ending to bring it all together. “It becomes a chance for the words and the sound and the movement to allow us to more deeply connect to each other, to ourselves and to the Divine, in whatever way you understand that,” Miller said. Before the dances began, Miller reminded the attendees that anyone is welcome to dance in the circle no matter what they believe or who they identify as. Michael Suing has been dancing in Vermillion since they started. He said Miller creates a welcoming space for people with the dances. Miller said he did his first dance at an interfaith retreat in Chicago in 1990. After that, he danced wherever and whenever he could. He said it was at a weekend dancing retreat in Iowa where he decided he wanted to start having the dances in Vermillion. Miller is also a pastor at the United Church of Christ in Vermillion and instructs religion classes at USD. He said the dances help get him out of his head. Betsy Hughes has also been coming to the dances since they started. She said she likes that people can come together with the dances. “You don’t know what another person’s belief is and you don’t know how they feel about politics or anything, and yet you’re sharing this space with them that is committed to being caring and inclusive and loving,” Hughes said.